Today was the beginning of another season in the D35 Class here on Lake Geneva. This first regatta, Grand Prix Les Ambassadeurs, is part of a series of regattas called "The Vulcain Trophy", which includes the Bol d'Or in June. 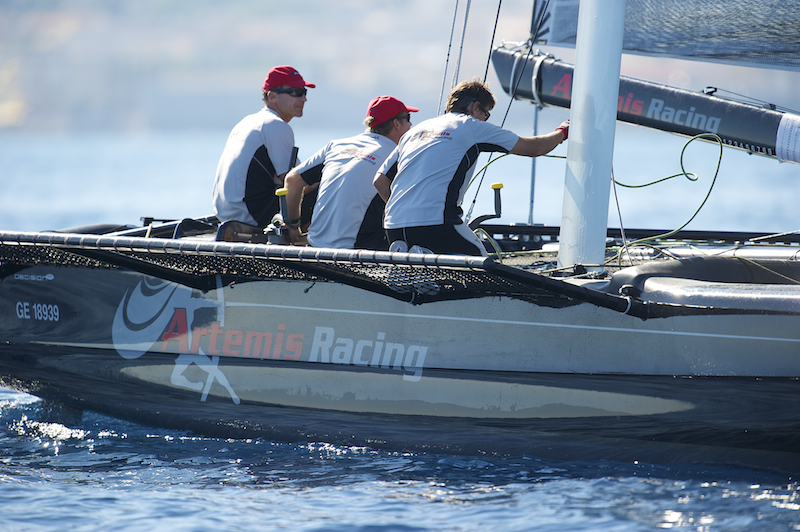 Artemis finished 4th last season and we were excited to get back out there this morning. Six races were planned for the fleet of nine boats sailing out of the Societe Nautique de Geneve today. We had clear blue skies this morning and the wind filled in around noon. Racing got under way at 1230. 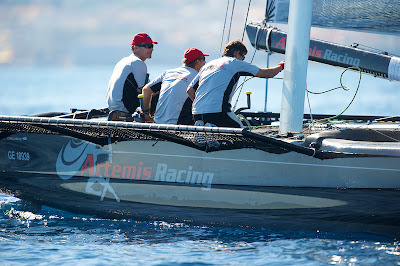 We had a very mediocre day onboard Artemis during the first 3 races, with scores of 8th, 4th and 6th, in the 6-8 knot breeze from the Northeast. Nothing in particular happened but a lot of little things did not go well. Probably a little "rust" from not having sailed competitively in the boat for six months. Then there was a long pause while the wind shifted 180 degrees and filled in at 20 knots with gusts to 22 knots and lulls to 9 knots. As the wind was coming off the city, it was very puffy and shifty. The sailing was very exciting and the boats were traveling at high speeds in the conditions. We'd had a decent third race in the 4th race of the day were sailing upwind on starboard tack and we were on a collision course with Zen who was on port tack. They tried to slow down to get behind us and miss judged it. The result was a violent crash into our port side. The hull is ok but the port "rack" is destroyed. We had to withdraw from further racing for the day. One of our crew members was thrown into the water from the impact and we narrowly avoided a pitch pole (capsizing by putting the bow under (a cartwheel) as Zen spun us away from the wind. Anyway, we got the boat back to the dock at the SNG and are in the midst of a repair so we can compete again tomorrow.